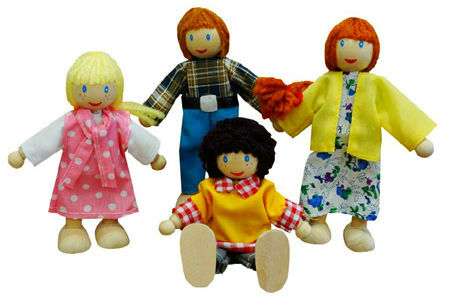 Wooden Doll Family White is a great set of wooden toy dolls dressed in cotton clothing with big smiles on their faces. Each doll has stiffened rope arms and legs which are very flexible and easy to bend. Nice big feet mean they stand up easily. Wonderful for imaginative play these simple dolls will give hours of fun pretend play. Material: Wood with cloth clothing. We like this because: "Its fun to play with the whole family and pretend to be Mum, Dad, Sister and Brother."